Most probably the plane represented on the coin is a Blériot model XI with an 80 hp Gnome engine, one of the almost 100 units manufactured by the French producer. Elena Caragiani was born in 1887 at Tecuci, in a family with Aromanian roots. Her father was medic. Elena's uncle, Ioan Caragiani, was born at Avdela (or Avdella, nowadays in Greece), and was member of the Junimea (Youth) Literary Society from Iaşi and founding member of the Romanian Academy. Unfortunately, in spite of the fact that the Internet is full with pages presenting the biography of Elena Caragiani, a large part of the information cannot be verified and seems to be originating in romanced biographies or seems to have been invented by journalists eager for sensation. In 1912 Elena Caragiani flied for the first time in her life, with a plane piloted by Mircea Zorileanu (1883-1919, who owned the pilot's licence number 2 issued in Romania - in 1911). Former cavalry officer, converted to aviation, Mircea Zorileanu was Elena's equitation teacher. 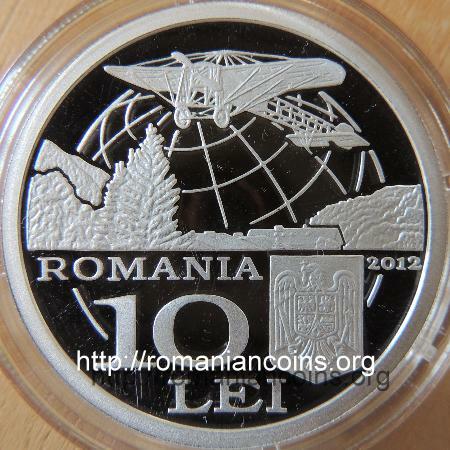 Elena Caragiani followed the courses of the flight school organized at Cotroceni airfield by Liga Naţională Aeriană (National Aerial League), an aviation association established by George-Valentin Bibescu (1880-1941, first Romanian to obtain a pilot licence) in 1912. In numerous web pages (including  and ) it is claimed that after graduating the flight school Elena Caragiani could not obtain a Romanian pilot licence, because the applications sent to the Ministry of War and to the Ministry of Cults and Public Instruction would have been rejected by the ministers - general Grigore Crăiniceanu (1852-1935) and Spiru Haret (1851-1912). But the two politicians were not ministers in 1912-1913 period. In 1913 she departed for France, where she attended the courses of the flight school owned by the French pilot Roger Sommer (1877-1965). The Sommer's hangars were placed inside the military base of Châlons, base also known as Mourmelon le Grand. In January 1914 Elena received her pilot license, issued by the Fédération Aéronautique Internationale (World Air Sports Federation). It was the twelfth international license granted to a woman and, of course, the first for a Romanian woman. In France Elena worked as reporter for an important French newspaper , ,  (but its name is not mentioned on the Internet sorces found by us!). On 26th of February 1914 she arrived in the United States of America. She crossed the Atlantic Ocean with a ship named Olympic, after having started the voyage in the French port of Cherbourg . After , Elena has taken her plane with her in America, a Blériot plane. A note published in some newspapers from New York in 27 februarie ,  announced the arrival of the Romanian "aviatress" and her intention to fly over the United States immediately after the necessary arrangements to obtain a plane were made. In another newspaper published in may  Elena was presented as having her own plane. In July 1916 Elena returned to New York , coming from Liverpool, Great Britain; in September 1916 she was mentioned in San Francisco Chronicle newspaper. She participated to the WW1 as a nurse. After the war she returned to France, and worked as a reporter specialized in aviatic events. Elena Caragiani died in 1929 of tuberculosis, being buried at Bellu Cemetery in Bucharest. Nowadays a high school in Tecuci (her birthplace) bears the name of Elena Caragiani. 1. ***, aviatori.ro, Dicţionar de personalităţi, C, retrieved June 2013. 2. 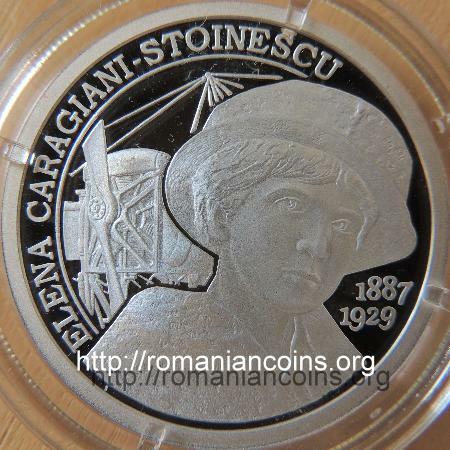 ***, Celebrate 100 Years of Licensed Women Pilots, 1914 (Feb 6) - Roumania - Elena Caragiani-Stoenescu, retrieved June 2013. 3. ***, The Statue of Liberty - Ellis Island Foundation, Inc., libertyellisfoundation.org, retrieved June 2013. 4. ***, Enciclopedia României, Elena Caragiani-Stoenescu, retrieved June 2013. 5. ***, New York State Digital Library, The Daily Long Island Farmer, nr. 26, 27th of February 1914, retrieved June 2013. 6. ***, Newspaper Archieve, New Brunswick Daily Times, nr. 26, 27th of February, retrieved June 2013. 7. ***, Newspaper Archieve, Orange County Times Press, 29th May 1914, retrieved June 2013.